This tasty and filling main meal is simple to make and goes well with strained barszcz as a drink. 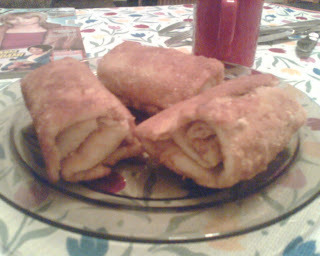 It consists of minced meat filled pancakes, rolled and covered in breadcrumbs and then fried. At Christmas Eve it is eaten in it's vegetarian form. In order to make these you will need to make crepe pancakes and I outline a method which works well for me in the link below but use any method which you like. Any lean meat you wish, chicken is good. 4. 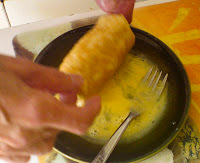 Fold in half so that ends overlap by a few centimetres and roll perpendicular to this fold (You should end up with something like in the photo). 5. Mix whole raw eggs in a small flat bowl to which you dip folded pancakes. 6. Straight away dip pancakes with egg coating into plate of breadcrumbs. 7. 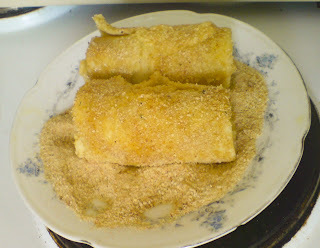 Repeat process of dipping in egg and then breadcrumbs until desired thickness of breadcrumb coat is attained. 8. Fry in pan with oil on low heat until breadcrumbs brown and inside hot. 9. Serve straight away with cup of barszcz.